In December 2015 this book has been published in Chinese by the Chinese Social Science Academic Press. Translation by Feng Xiying under the lead of prof dr Zhang Haidong from Shanghai University. Read an introduction in English to this publication here. 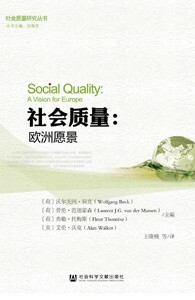 The introduction also covers the publication in Chinese of the book Social Quality: A Vision for Europe (see below). 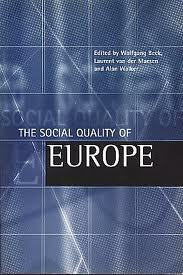 This book provides the most up to date account of the concept of social quality. Developed originally as a response to the promotion of neo-liberal policies in Europe, the idea has been taken up and applied in China and East Asia. This book is the key reference point for the continuing spread and adoption of the concept. It develops the theoretical foundations of social quality and locates it within the main theoretical frameworks of western social science. 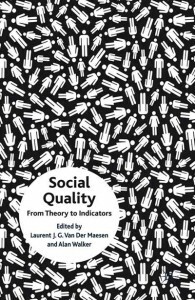 It provides a clear account of the methods for measuring social quality which includes the initial indicators developed by a major European research project. It includes an in-depth analysis of the four core components of social quality: socio-economic security, social cohesion, social inclusion and social empowerment. Then it applies the concept of social quality to some of the most pressing policy challenges, including the future of the European Union and sustainability. Its theory, methods and compelling arguments in favour of social justice are essential for students studying a wide variety of social sciences and policy makers and general readers interested in creating a more socially just society. Laurent van der Maesen - Director of the International Foundation on Social Quality, based at the International Institute for Social Studies in The Hague, the Netherlands. His previous publications include The Social Quality of Europe (co-edited with W.Beck and A.Walker) and Social Quality: A Vision for Europe (co-edited with W.Beck, F.Thomese and A.Walker). Alan Walker - Professor of Social Policy and Social Gerontology at the University of Sheffield, UK. His previous publications include East Asian Welfare Regimes in Transition (co-edited with C.Wong), Social Policy in Ageing Societies (co-edited with G.Naegele) and Fighting Poverty, Inequality and Justice (co-edited with A.Sinfield and C.Walker). Translation by Wang Xiaonan under the lead of prof dr Zhang Haidong from Shanghai University. 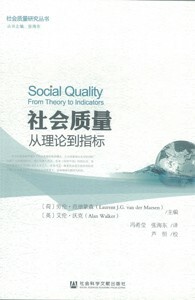 The introduction also covers the publication in Chinese of the book Social Quality - From Theory to Indicators (see above). This volume represents the outcome of two years of intensive debate about the future of Europe. It aims to provide the European Union with a vision: one that will unite all of its citizens and help to create the democratic legitimacy that the EU currently lacks. 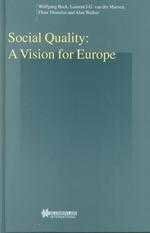 It builds on the first book on social quality, The Social Quality of Europe, which introduced the concept and which has been enthusiastically received by both the scientific and policy communities. The book develops three crucial elements of social quality: the theoretical validity of the concept, its practical application, and its identity or `genetic code'. It establishes an independent identity for social quality, with a unique focus on the quality of the social, which enables it to act as the rationale for economic, social, and cultural policies and, therefore, an escape route from the dominance of narrow economic thinking in policy making. This book is essential reading for anyone interested in the future of Europe: policy makers, scientists, NGOs, and students of social policy, law, economics, sociology, and political science. R. Prodi, President of the European Commission. A. Diamantopoul, Member of the European Commission, responsible for Social Affairs and Employment. Wolfgang Beck European Foundation on Social Quality, Amsterdam, The Netherlands. Yitzhak Berman External Research Associate, European Centre for Social Welfare Policy and Research, Vienna, Austria. Jan Berting emiritus, Jouques, France. Denis Bouget Maison des Sciences de l'Homme Ange Guépin, Nantes, France. Maria Calloni London School of Economics, London, United Kingdom. Kjell Eliassen Norwegian School of Management, Oslo, Norway. Adalbert Evers Institüt für Wirtschaftslehre des Haushalts, Justus-Liebig-Universität, Giessen, Germany. Christiane Villain-Gandossi University of Provence, Aix-en-Provence, France. Kees van Kersbergen Department of Social and Political Sciences, University of Nijmegen, The Netherlands. George Konrád literator, Budapest, Hungary. Ota de Leonardis Department of Sociology, University of Milan, Milan, Italy. Laurent J.G. van der Maesen European Foundation on Social Quality/SISWO, Amsterdam, The Netherlands. Antonio Ojeda-Avilés Faculty of Law, University of Sevilla, Sevilla, Spain. David Phillips Department of Sociological Studies, University of Sheffield, United Kingdom. Guy Standing Socio-Economic Security Programme, International Labour Organization, Geneva, Switzerland. Göran Therborn Swedish Collegium for Advanced Studies, Uppsala, Sweden. Fleur Thomése Department of Social and Cultural Studies, Vrije Universiteit van Amsterdam, Amsterdam, The Netherlands. Georg Vobruba Institut fur Sociologie, Leipzig, Germany. Alan Walker Department of Sociological Studies, University of Sheffield, United Kingdom. This book brings together leading European social scientists to focus on the essential questions concerning the future of the European Union (EU). The Social Quality of Europe contains the most comprehensive and detailed analysis conducted so far of the relationship between EU economic and social dimensions. It introduces an entirely new concept to European discourse-social quality-which will inspire examination and debate from a unique perspective. This work consists of specially commissioned original chapters-from experts in the fields of economics, law, political science, social policy, and sociology-together with critical commentaries and syntheses focusing on employment, social protection, social exclusion, and provision for older people. It provides a unique source of reference on current economic and social policies in the EU and sets the agenda for a new debate about the quality of life aspired to by European citizens. The book is essential reading for undergraduate and postgraduate students in the social sciences; policymakers at local, national, and state-of-the-art assessment of European social and economic policies. 1. Introduction W. Beck, et al. Part One: Economic, Legal, Political and Social Dimensions­ Analyses and Commentaries. 20. Social Quality: From Issue to Concept - W. Beck, et al. 21. Conclusion: Towards Social Quality in Europe - J. Baars, et al.